Summary: Is your struggle against sin an up and down experience? Put on God's two Gospel shoes for victory. In these final scenes of Earth’s history, anyone who stands faithful and true to Jesus to the very end will be wearing a very unique pair of spiritual shoes. 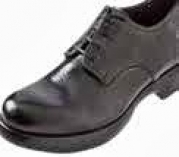 These powerful shoes are designed and crafted by the Eternal Airlift Gospel Shoe Company with a heavenly patent. We learn about these spiritual shoes in Ephesians 6:15: And your feet shod with the preparation of the gospel of peace. The reason our feet must be shod— or “shoed”—with the preparation of the Gospel is that without accepting the Gospel of Christ, we have no foundation to stand on while fighting the battles of life. We have no godly peace, and we get in painful trouble when traveling over rocky, thorny ground. Paul calls this Gospel of peace, “the gospel of the grace of God” (Acts 20:24). Divine grace is the great element of saving power; without it all human effort is unavailing (629). No one has been or will ever be saved apart from God’s grace (see Acts 15:11). So then, how is God’s grace—His wonderful power to save—revealed in the life of a believer in Christ? God’s power to save is revealed in two basic ways, because Ephesians 5:15 tells us our feet must be shod with the preparation of the Gospel of peace. Just as both of my physical feet have to be shod, both of my spiritual feet must be shod with the preparation of the Gospel of peace in order for me to not have a lopsided, shaky walk with Christ. Being justified freely by his grace through the redemption that is in Christ Jesus: Whom God hath set forth to be a propitiation through faith in his blood, to declare his righteousness for the remission of sins that are past, through the forbearance of God (Romans 3:24-25). When we personally accept by faith that Christ’s death on the cross is the forgiving, healing, saving sacrifice for our sins, the death penalty we deserve is laid upon Christ. We are free, forgiven for our past, justified, and reconnected to God! This is the first shoe—the grace of God’s loving favor for a people who don’t deserve it. This spiritual shoe enables us to stand unflinchingly under the devil’s accusations and suggestions that we cannot be forgiven for what we’ve done wrong. When we receive the grace of God to forgive our sins because Jesus died to pay our death penalty, we become brand new by the work of God’s grace upon our hearts. Paul tells us in 2 Corinthians 5:17-19 that we even become Christ’s ministers of reconciliation, regardless of our physical or social status. Do you feel like Christian living means striving to follow a set of impossible rules in an attempt to please God and obtain forgiveness? God is gently calling you right now. Quietly, in the privacy of your thoughts, God is asking you to put on shoe number one of His healing Gospel. Tell God you accept Christ’s death on the cross for your sins and thank Him for His amazing unlimited, unmerited favor in forgiving you for the sins of your past. The Gospel of God’s grace also provides “obedience to the faith,” that is, power to obey (Romans 16:26). Ephesians 2:10 tells us that through Christ, the born again believer is created unto good works. Whose works? The works of Jesus! The second shoe of God’s grace provides the power and sufficiency to work out what the Lord works in us by His Holy Spirit—to actually live the life of faithful obedience Jesus lived here on earth, fueled by the saving power of God (Philippians 2:12-13). Do you find yourself in a constant up and down Christian experience of accepting God’s grace of forgiveness, but missing the grace of God’s overcoming power to put to death your earthly attitudes of anger or fear? Consider Romans 6:14-15: For sin shall not have dominion over you: for ye are not under the law, but under grace. What then? shall we sin, because we are not under the law, but under grace? God forbid). Could this really be the way it is with God’s grace? Yes, a thousand times yes! Ephesians 3:20 assures us of God’s desire to supply us abundantly with the power of His saving, healing, and transforming grace. If you find yourself dealing with sinful attitudes that won’t seem to go away, recognize that God is calling you not only to surrender the controlling sin of your life and receive Christ’s death on the cross for that sin, but also to accept the empowering grace of God to obey Him. Allow Him to fill you with new love and power to obey His Word. He will give you your heart’s desire. Shoe #1: Unmerited favor for forgiveness for our past. So, how can you grow in grace? 1. By faith, study to know Christ Jesus better. As you behold His life, you are giving the Holy Spirit the right to infuse your heart with Gods’ love and transform your heart to be like Him (see 2 Corinthians 3:18 and Romans 5:5). 2. By faith, choose to hide His Word in your heart through reading and memorizing. Scripture is the key tool to use against the enemy’s tempting suggestions to disobey God (see 2 Corinthians 10: 3-5 and Psalms 17:4). 3. By faith, choose each day to walk in Jesus’ footsteps by responding to life’s situations according to His will, not your own (see 1 John 2:6 and Luke 22:42). Let’s go to the throne of grace, to the entrance of the Eternal Airlift Gospel Shoe Company, and ask for a free pair of shoes of the Gospel of the grace of God, and put both shoes on, so we don’t have to struggle with a lopsided, shaky walk with Jesus.